I am super excited to find a new series of Red Dwarf on the telly! Red Dwarf X (RDX) is the latest installment in the well-loved Red Dwarf series. I have fond memories of me as a spotty teenager staying up late on a Thursday night to watch it. My television reception was terrible so it took me years to realise that the set was originally made of cardboard. It looked like a spaceship to me! I’m eternally grateful to my dear Welsh friend Ceri who when she realised I was a whole series behind in Red Dwarf (due to me living in the UK and the UK being two series ahead at the time) had me over to her house for the entire day so we could watch the videos (yeah videos!) so I could be up-to-date on what was happening in outer space. Now that’s friendship! 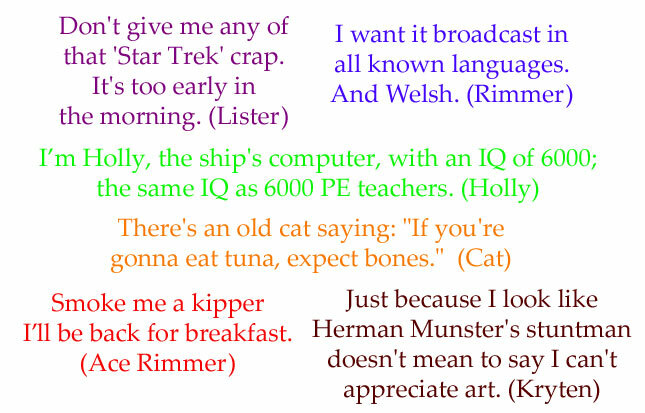 I’ll leave you with a little snippet from Patrick Stewart and what he thought when he first watched Red Dwarf. So don’t call me on Wednesday nights at 9.30pm because I’ll be watching RDX on my ABC. Previous Kerbside treasures Next Do you know what this week is?